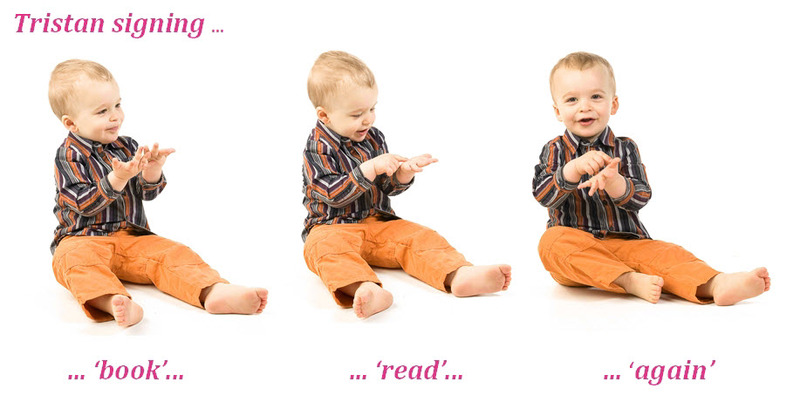 When was the last time you wished you could read your baby’s mind? 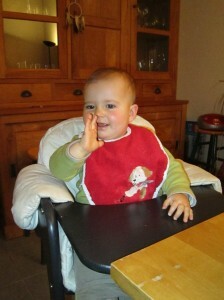 Instead of trying to be a mind reader enable your baby to communicate through baby sign language. reduce frustration for you and your child. I have compiled some wonderful signing anecdotes told by mamas from around the world in my free e-Book Wanna Rock for Your Baby? 12 Compelling Reasons to Sign with Your Hearing Child. Babies can construct language in their head from as early as 9 months of age. Did you know that? The thing is the complex musculature and sufficient control over the vocal cords needed for speech develop much later (a 3-word vocabulary is average for a 15 month old toddler). What does develop at about the same time as the ability to construct language is the ability to communicate with gestures or signs. 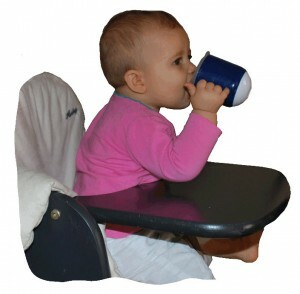 Babies of deaf parents have done it for decades, your baby can do this too! I have had a passion for communication ever since I was a baby. My mum tells me that I started to speak when I was only 9 months old (this is unusually early and I was called the talking baby as a result). From my mum I also know that up until then I was a very grumpy baby. Language opened the world to me, so it is maybe not surprising that I chose a career in marketing communications. When my son, Tristan, was born in 2008 I realized that 10 years of professional experience in communications were worth very little when it came to my baby. When I heard about baby sign language I knew this had my name written all over it. I introduced my son to baby signing with incredible success. He spoke 6 words and actively used 32 signs with only 12 months. At the age of two he was fluent in his two primary languages (German and Dutch) by which time he had also developed an impressive English vocabulary. He hardly ever cried and has always been able to express himself very well. This experience and my desire to find a more meaningful path professionally led me to the decision to share my method of using baby sign language effectively with other mamas. I taught live classes until my daughter was born in February 2012. Her birth and my desire to reach more families around the globe, were the reasons to launch my baby signing e-Courses. My daughter is now 13 months and has an active vocabulary of about 60 words (a mixture of spoken words, signs and a combination of the two). The average vocabulary of a two year old is 50 words. Thank you Diana for this wonderful course! I found the audio recordings were great for listening to in the car and on my phone… Truly portable and time saving! 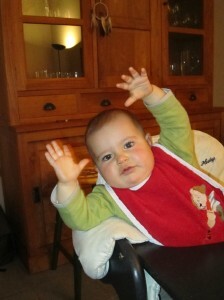 I’m also happy to report 9 month old Miguel has learned to use 4 signs during this course! It took much longer for my older son to begin signing and I think UYBT was a big factor in this. Keep it up, this is a great resource! My 13 month old daughter and I loved the online Understand Your Baby’s Thought course! It was full of interesting information, fun activities and a structured easy-to-follow approach for a working Mama to learn signing with her baby. Thank you!! I am happy to announce a new category on my blog called product reviews. In this category you will find reviews of products as well as recommendations based on personal experience. Below you can find three examples of products I will be writing about in more detail. For products I recommend, I also offer the option to purchase. Stay tuned for more …. A little while ago I encouraged you to bring music into your child’s life. 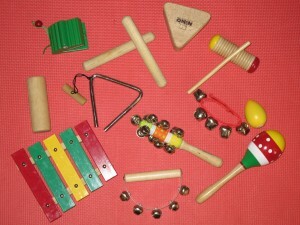 In that earlier blog post I promised tips for musical instruments for young children. Here is a selection of purchased instruments which both of my children and the babies in my live baby signing classes have always enjoyed playing with. Introducing your children to music brings along more than just the music making experience. I will explain more about this in the following video. In the video I will show you several purchased instruments as well as tips for home-made instruments. Enjoy! I have searched Amazon UK, Amazon Germany and Amazon US for sets of musical instruments. I found by far the best selection (also including most reviews) on Amazon.com. As the sets mainly include plastic instruments, I have added a few wooden items separately. I only know a few of the items personally so I recommend you read other parents’ reviews. Go to the first blog post Bring music into your child’s life. 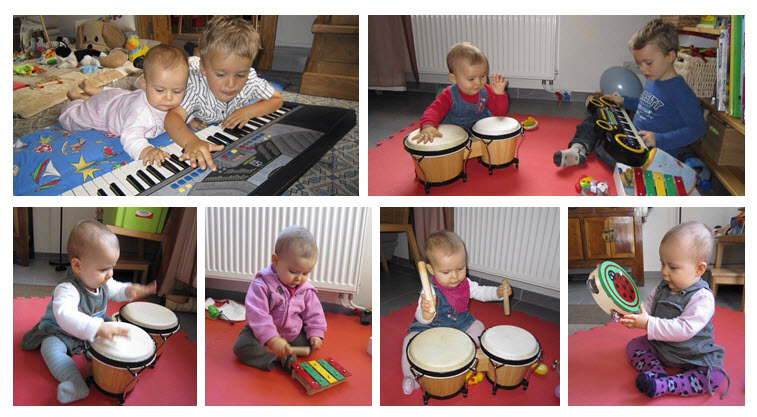 If you have any suggestions for musical instruments (purchased or home-made) or fun play along music, please do share. I was not exposed to much active music making when I was a child and I was certainly not great at singing in tune. I have always enjoyed moving to music but only discovered a passion for singing when I had my son. With my lack of musical ability, I only sang to him when I could not be overheard in public. When Tristan was about 8 months old I found out about this wonderful early childhood music programme called Music Together which offers music to babies and toddlers in a very playful and non-performance oriented learning environment. I enrolled Tristan and myself in this programme and we followed the classes for two years. It was wonderful to see him grow not only in terms of musical skills, he also developed self-confidence and social skills through being part of a group of adults and children of mixed ages. Having learned so much about music and the effects of active music making, I have been exposing my daughter, Briana, to music from the moment she was born. The first few months I mainly sang to her and as soon as she was able to hold objects with her little hands I started offering her small instruments and made music with her. She particularly enjoys playing the drums, the piano and the xylophone. Today I took Briana to her first Music Together class and she curiously explored the new environment and happily tried out some new instruments. From a health perspective, music has been found to: enhance cognitive development in children, exercise the brain, help fight memory loss, reduce stress, lower blood pressure and even stave off depression. Some of the social benefits of music making include: inspiring creativity, increasing productivity, building confidence and creating social connections/bonds. Watch out for a continuation of this post with ideas for musical instruments (bought and home made) as well as tips for great play along music available on iTunes. 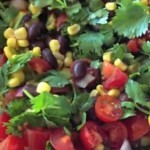 Click here for the continuation of this blog post. By the way, I have not been asked to write this post nor am I receiving anything in return, I am sharing this information with you because I truly believe in early childhood music education. Other programmes I have heard of are Kindermusik and Musik Garten. I would love to hear about your music making experiences in your family. Briana only just turned 10 months and she already has a vocabulary of 15 signs (hello, good bye, milk, eat, drink, more, all done, cracker, dog, sleep, bed, light, shoes, hat and rain); how wonderful is that! The method I use to enable my daughter to share her thoughts, is the method I teach in my courses, so you too can enable your baby to communicate before s/he can speak. When I’m having trouble getting Tristan out of bed in the mornings, I know what I need to do. I have his 9 month old sister, Briana, do the waking up. I put her in his his bed, belly on belly. While she starts crawling all over him and gently (or sometimes not so gently) discovers his face with her little hands, Tristan’s arms reach out and fold around his little sister giving her the most loving hug. All this while his eyes are still closed, then I see a beautiful smile on his face and I know the day can begin. This morning scene lets my mother heart overflow with joy; and it could so easily be different. Briana has been a cry baby until very recently and it’s been very hard on all of us but I feel especially hard on Tristan. Not only did he have to share mummy with his little sister; no, his little sister asked for so much of mummy’s attention that there was so little left for him. Far too many times I snapped at him simply because of the nerve-wrecking crying (or rather screaming) and the sleep deprivation and not because he deserved it. Screaming through countless dinner times, too loud to have a conversation. Plenty of bed time stories cut short because I could not read louder than Briana would cry. He could have so easily blamed it all on his sister. So you can imagine that I’m thrilled to bits when I see how much he loves her. Since she is better he calls her ‘princess’. Isn’t that the sweetest thing? In these past 3 weeks, Briana has truly blossomed. She is now actively using four sings, so she can tell me about ‘dogs‘, wave ‘hello‘, let me know when she wants to ‘drink‘ and tell me when she wants ‘more‘. She started to crawl, she eats finger food all by herself, she consistently stretches her arms high above her head to the question ‘How tall is Briana?’, she roars like a lion when you ask her ‘What does the lion say’ and she will happily clap her hands to the German children’s song ‘Backe, backe Kuchen’. She takes her milk from the bottle and mostly falls asleep by herself (I used to feed her to sleep on the breast) and since daddy has taken over the night shift, she now only wakes up once or twice for a sip of water and goes back to sleep (we’ve come from me feeding her 4 or 5 times per night to avoid her screaming). We finally have time and energy to look at books, sit on the floor to play with her toys, make music and explore this wonderful world together. At the weekends, Tristan now gets his good night stories after his sister has gone to sleep and we cuddle up in his bed together. We also made and decorated biscuits which he thoroughly enjoyed :-). I feel blessed with my family. When I gave Briana her lunch today I had forgotten to put her water on the table. I fed her a few spoons of her food and then she signed ‘drink’ as if she’s always been doing this. I’ve been using the sign pretty much since she has started eating solid food (from 6 months) but she has never actively used it. And to be honest there has not really been a need for her to use it, because I probably offered more water than she wanted. Sometimes we need to give our children a chance to sign. She has also had a good go at the sign for ‘more’ and when we went for a walk today (she was tilted all the way back in her stroller ready to go to sleep), our neighbour walked past and said hello. When Briana heard me say ‘hello’ back she started waving even though she could not see the neighbour and I had not waved at him. I first thought it was a coincidence that she made a waving motion right at that moment but she did it again when her big brother came home and when we saw the grandparents on Skype. That’s three new signs in one day (two days before she’ll be 9 months). I’m chuffed my little princess. During our last stay with my grandparents in Germany (I turned 8 months when we were there) everyone seemed to be tapping their thighs when my hairy friend Nemo was around. I had no idea what that was all about but thought that maybe Nemo likes it. As I’m crazy about Nemo, I decided to join in. After a while I noticed that they were still doing it when they only talked about Nemo and he could not even see it. Hmmm, so you tap your thigh when he is around and when you talk about him, ok, I can do that too. Back home, I tried it out when I saw a picture of Nemo and mummy got all excited. Saying ‘yes, that’s right, honey, that’s Nemo and he is a dog’ while tapping her thigh again. So then I was wondering what would happen when I tap my thigh when I see a picture of a different dog and put it to the test: it produced the same excitement with mummy! I’m getting the hang of this, whenever I see a dog, I can let mummy know by tapping my thigh, fantastic! Yesterday, I spotted a dog on mummies Facebook page (I was sitting on her lap), so I tapped her thigh to let her know. It was a funny looking dog though with red reindeer antlers on his head :-). I can teach you too, watch me in this video. Thank you to everyone who participated in my raffle for a free pass to the online course Understand Your Baby’s Thoughts – 5 Simple Sings that open the Door to Your Baby’s Mind. CONGRATULATIONS TO THE 10 WINNERS! And here are the winners’ names: Adriana, Angelina, Christine, Elizabeth, Elke, Marta, Mette, Ruth, Shadae and Therese. If you submitted your name for the raffle and are not among the 10 winners, I would like to offer you a place on the course for 27€ instead of the regular 37€. Please contact me via my contact form if you would like to register. I’m looking forward to getting started on Monday, 12 November 2012. As you know, the course is delivered online and you can work through each of the 5 modules from the comfort of your home at a time that is convenient for you.